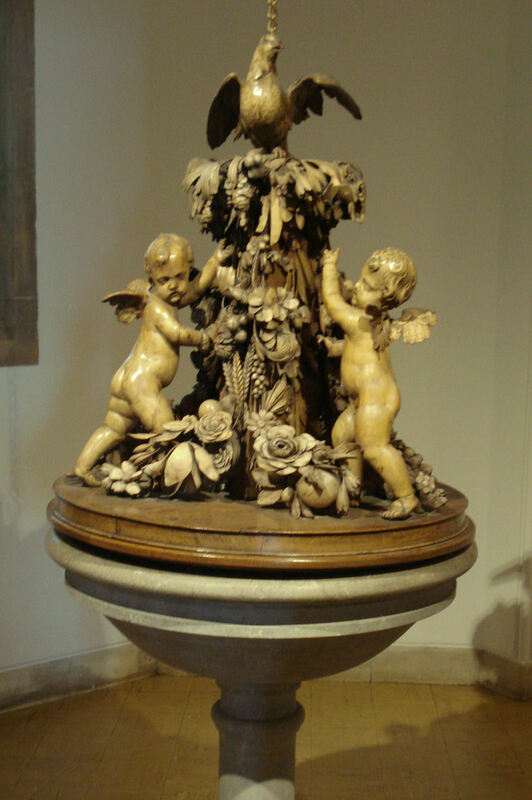 After the Tate Panel painting, by far the most important artefact in the church is the magnificently carved font cover, for which Grinling Gibbons was paid the sum of £12. The cover is made of limewood, and was given to the church by Mr James Foyle in 1682. The font was carved by hand from Gibraltar limestone by a Sicilian prisoner-of-war named Tulipani, and is a memorial to the tunnellers of the Royal Engineers. It stands in the Baptistry of the church, which was rebuilt after the war by the Northcott family in memory of Commander WC Northcott RN. The modern stained glass in the Baptistry was designed by Keith New, and is dedicated to the memory of the de Selincourt family.